The most recent episode of “The Woodwright’s Shop” has Roy Underhill and Christopher Schwarz discussing staked furniture. Part of the discussion is how to layout and cut octagonal tapered legs. Just before CW starts the explanation of how to layout an octagon with a compass, Roy pulls out a gauge that he jokingly refers to as a “Octagonizer”. Of course my ears perked up with interest. The gauge seemed to work much like a center marking gauge in that it registered on either side of the stock. The difference being this gauge had two marking pins and established the extents of a regular octagon. Not much more than that was presented in the show and I was left wondering about this gauge. I have several octagonal tapered legs in my future and a gauge such as this could prove handy. After consulting the Google, I found that this gauge is a common boatbuilding tool referred to as a “spar gauge”. 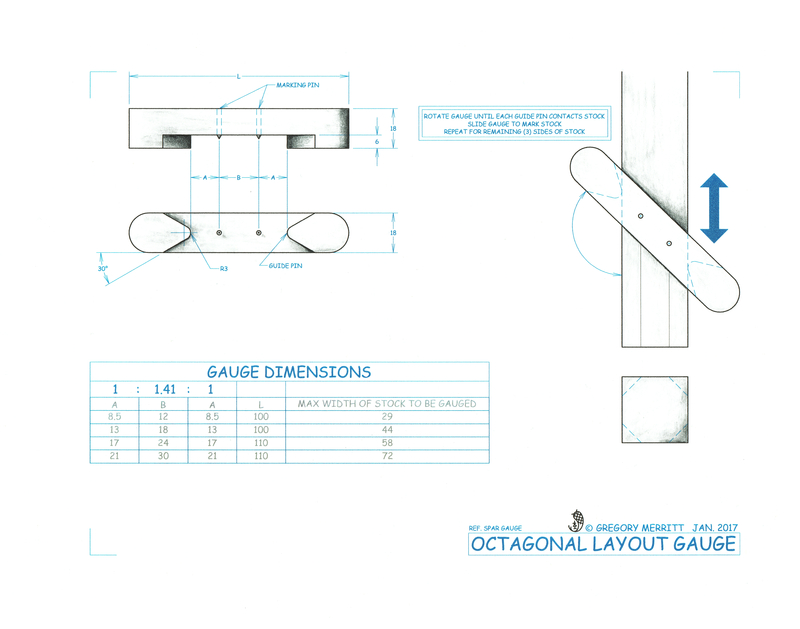 The gauge is used to layout a regular octagon on a spar blank to aid in the rounding process. It is also quite large. Much too large for working on small leg stock for staked furniture. So I did a little more digging. Turns out the pin arrangement on the gauge is based upon the proportional relationship of the corner of the square that is removed to create the octagon. More in-depth information can be found here. 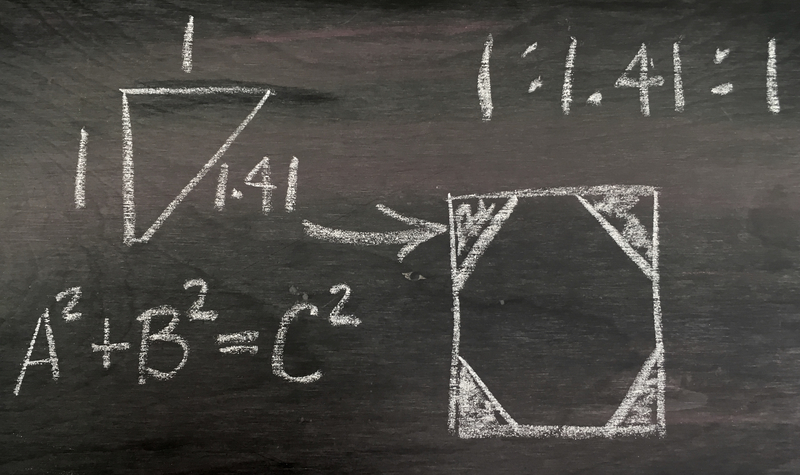 Using the Pythagoras’ theorem, you find that the proportional relationship of the sides and diagonal of this waste corner if, 1 : 1.41 : 1. So with a little math you can make any size gauge you desire. With this information in hand I sat down at the drafting table and worked out a design for a scaled down gauge for furniture sized legs. This morning I put that design to the test in the shop. 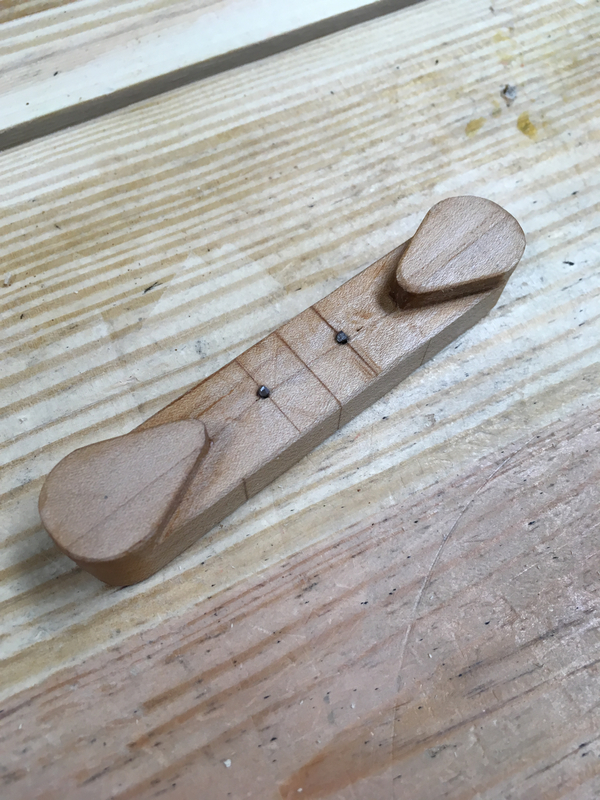 I scrounged up a small piece of maple, a couple of finish nails and made myself a octagonizer for laying out octagonal legs for my staked furniture projects. It’s really simple to use. Place the gauge on the wood and rotate it until the guide pins make contact with opposite sides of the stock face you are marking. Then either press down to create marks or slide the gauge to scribe in the extents of the side of the octagon on that face of the stock. Repeat for the remaining three faces of the stock. Then connect the points on the end of the stock to delineate the octagon. In the photo below I used a compass to layout the octagon and verify the accuracy of my new gauge. This thing is fast and accurate. You really only need to mark points on one side. Then take a pencil and set your finger gauge to one of the dots and quickly mark all faces of the stock with that setting. If you like to taper your legs before creating the octagon, this gauge will automatically adjust for the taper as you scribe down the stock. How slick is that? Anyway, of course I made a construction drawing. I included a chart with a few different sizes that will handle varying thicknesses of stock. This entry was posted in 5-Tools, Design, Octagonizer Gauge and tagged Christopher Schwarz, octagon, octagonal tapered leg, Roy Underhill, staked furniture, The Woodwright's Shop. Bookmark the permalink. Pretty cool Greg, not piss-poor at all. I always prefer the clean, concise videos rather than the overproduced ones. I was fortunate to be able to use that tool at the Woodwright’s School in November. I thought it was the neatest thing ever. When I returned home, I got online and tracked it down, same as you. I’ve made a couple of them now, for me and for friends. I made mine to be used with a pencil, and also to mark a center point or line. I’ll post some pictures on instagram. Awesome! I have a multifunction version in the works specifically for tapered legs. Pictures are up, on instagram. if you look for spar gauge or octagonizer, they should come up. My username is xoney01. Nicely done, and a great name. Note that you can also use the compass to layout the gauge, just like you did on the end off the stock piece. Set the compass using a square equal to the space between the guide pins. No math required. (Haven’t watched the video yet, my android isn’t open to as many video formats as one might like). Name credits go to Mr. Underhill. First day back at work after 2 weeks vaca and felt the need for a break, so I watched your video — great job!! Looking forward to more, and to your next version of the gauge. 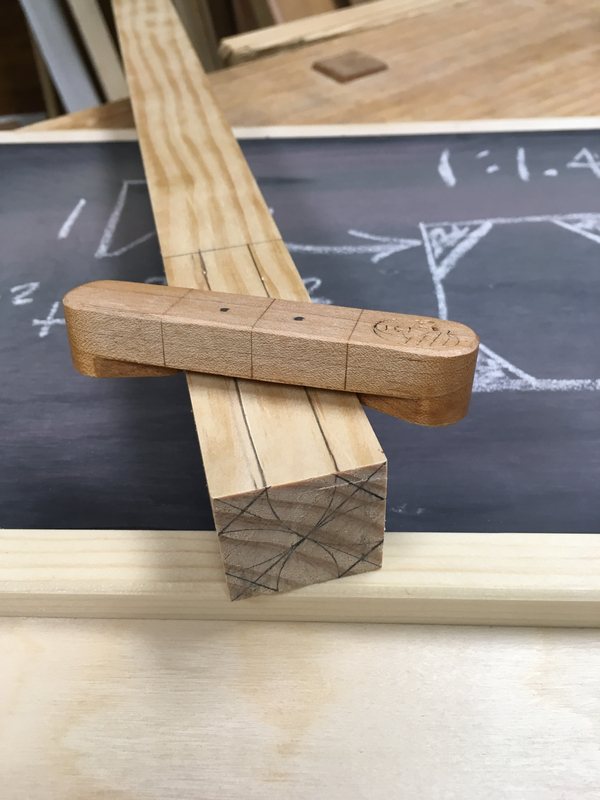 Why anyone would bother with laying out an octagon on the end of a stick…the easier way is to lay a ruler diagonally across one face (same as dividing into equal parts)…if you’re working timbers use 24″ and mark 7″ & 17″…for smaller stock simply proportion the ruler to the stock (3.5″ & 8.5″ on a 12″ rule) then proceed with a combination square and a pencil. The jig works best for tapered sticks (boatbuilders use them for masts). The ruler method works great, but can be a little cumbersome on smaller, furniture sized pieces. Personall I like 3,7,10. Works for imperial(3″,7″,10″) or metric(30mm,70mm,100mm). I needed to show this gauge as background to what I have coming up next. …totally out of the loop, working on my house, sorting tons of stuff, deciding where I want to go with my life. Spar gauges solve the problem of having two ends that taper – as with booms, masts etc. Thanks and thanks for the link to your post. The gauge is handy, but I have a modified version in the works specifically for staked furniture legs. It may turn out to be a flop, but I have high hopes. Greg .your a natural on camera mate hope there will be more from you. i am a visual learner .i find magazines and books hard to learn from. and example would be your polissoir article i still cant get it right. you should start a youtube channel .you might do a few knot tying vids. best of luck anyways and happy new year. Thanks for the video. Here’s another vote for the video learner. You’re video is great. I’ve been following you since I learned you are the master behind all of the drawings for Paul’s work. Please make more, I think your will generate a huge following. Happy New Year. Your welcome and thank you for the kind words. My New Years resolution is to start making videos. So I’ll give it a go. Awesome production/directing – great video! Your video put a big smile in my face this morning! Video is a lot tougher than I thought it would be, but I have at least taken the first shaky steps. Nice video! I really like this way of laying out octagons. I don’t like having to continually look at the ends to see how I’m doing. Thanks Brian. I hope to be able to demonstrate how I have been laying out and cutting legs for staked furniture. I think its pretty slick…but I’m biased. I like your description of how to make this elegantly simple and useful tool but in my experience, it’s not so useful when making chair legs. I can take a square length of stock, mark an octagon on the larger end, and after inscribing a smaller square on the lower end (foot) of the leg, I can layout an octagon withing that area. 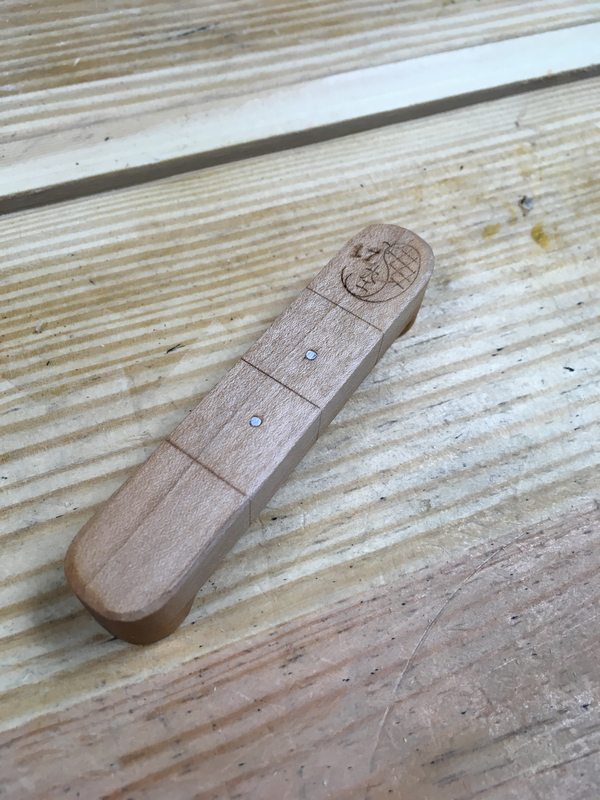 After the layout I can go directly to the shaving horse and work down to these marks on the ends with a drawknife, producing the octagonal sides and the tapered length. There is, therefore, no need to produce a taper before using such a tool in order to produce tapered legs. I also find that I get just enough entasis when I don’t strike a set of lines along the full length. Thanks…there is more to come from me on this subject. Hopefully some may find this gauge useful. I take it a step further when making my legs and this gauge will help explain my next step. Good stuff, Greg. In the past when I needed to make round stock from square, I would start with octagonizing. I have a spreadsheet that uses the same mathematical principle. It gives the distance from an edge that I need to mark a line so that when I chamfer to those lines I get a perfect octagon. Math is great, isn’t it? Ha…math is handy stuff. Admittedly, I prefer physical geometry rather than raw numeric manipulation. I hope to have a demonstration put together soon on how I take this a little further based upon proportions and basic geometry. Have you made the same experience as I did? Making a video is another story than just writing about it. Excellent! you’ll be an internet woodworking star in no-time.